Indoor Air Quality is a major concern for anyone that spends an extended period of time indoors. It can impact the health, comfort, well being and productivity of building occupants. Most Americans spend up to 90% of their time indoors, we spend 1/3 of our life sleeping and many spend most of their time working in an office environment, which can have higher levels of pollutants than found outside. This can be pretty shocking, because most of us feel that we are safer indoors. Use one of our Coupons today and start purifying the air in your home, give us a call at 585-426-3004 and find out how we can help you breathe easy. Maintenance and operation of ventilation systems, moisture and humidity levels all play an important role in your indoor air quality. During the winter time, when you use your furnace the humidity in your home can drop drastically, making it very dry and causing scratchy throats and other irritants affecting people with asthma. Pollutants can be generated by outdoor or indoor sources, including building maintenance, pest control, housekeeping, renovation or remodeling, new furnishings or finishes, and building occupant activities. Pollutants may also contribute to irritated mucous membranes and sinus discomfort. Flu virus’s can run rampant through houses getting everyone sick. During the summer time, the humidity can drastically increase, causing moisture and dirt, which can cause mold and other biological contaminants to thrive in occupied spaces. Maintaining indoor air quality is vital and can be achieved by paying close attention to your homes HVAC systems. Pollutants can be significantly impacted by these systems and can even be distributed by these systems. In some cases your HVAC systems can even act as a source of pollutants. Like when your air filters have moisture in them, or if there is uncontrolled moisture inside of air ducts, it can cause microbial growth or mold. Your HVAC systems importance cannot be underestimated. The amount of outside air being mechanically brought into the building can play a factor in your Indoor Air Quality as well. It is also important to note, that no matter how well operated a house or building might be, it can experience periods of unacceptable Indoor Air Quality due to equipment breakdowns, inadequate maintenance or the actions of building occupants. Establish an effective smoking policy, most of us are aware of the health risks of smoking, but environmental tobacco smoke indoors can increase costs for maintaining the ventilation system, using a HEPA Air Filter is a great way to filter out tobacco smoke, dust mites and pet dander. Even if you don’t have pets, pet owners carry it around on their clothes and shed it throughout the day, you cannot get away from it. Having your ducts cleaned is a very good way to remove the pollutants that are already in your home. Do not block air vents or grilles, so you won’t unbalance your HVAC system or affect ventilation of other rooms, blocking air vents can affect air flow. Placement of equipment may affect the delivery of air to rooms if there is heat generating equipment like a computer or TV directly under your thermostat, and may cause your HVAC system to deliver to much cool air because the thermostat senses that room is too warm. Failure to dry water-damaged materials promptly, usually within 24 hours, or properly maintain equipment with water reservoirs or drain pans can have a drastic impact on your humidity levels. 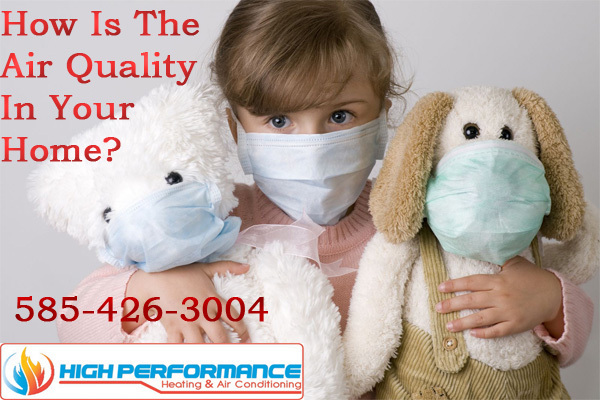 Good indoor air quality management can be achieved by having a highly trained and certified technician come to your home and evaluate your HVAC system. They can recommend certain HVAC attachments to your furnace or air conditioner so you can keep your indoor air quality safe and you can stay healthy. UV lights are a perfect way to kill microbial growth, virus’s and other harmful bacteria. Never worry about your home’s humidity again with an Aprilaire Humidifier. Protect your furniture, the wood in your home and protect your health! Use one of our coupons to get 10% off our Indoor Air Quality Package. With the summer rapidly approaching, indoor air quality is vital now more than ever. Pollen, air pollutants, pet dander, viruses, bacteria and mold don’t stand a chance with proper air quality procedures and preventive maintenance. Give us a call today and get in gear for summer, don’t wait till your having problems with your health. Stop the pollutants in their tracks and breathe easy with High Performance Heating, where we are more than just a name, we are a promise. Sign up for our exclusive monthly coupons and save even more money, with 10% off our Indoor Air Quality Package, it’s ever been more affordable. We’d love to hear from you 585-426-3004. Don’t want to talk on the phone? Not a problem! Email us at Customercare@highperformanceheating.com with any questions or to schedule an appointment.